When one of my oldest and dearest friends posted she was not going to be with her family on Thanksgiving for the first time in her life, her family was quick to mention that her signature Clam Dip would be missed. Ha ha! Well, you know I had to beg for any recipe that produces a reaction like that. Luckily, Shan was quick to oblige me. You probably want to go a bit easy on the garlic at first and then adjust it before serving. Unless you really like garlic and want to annoy your 8 year old son. 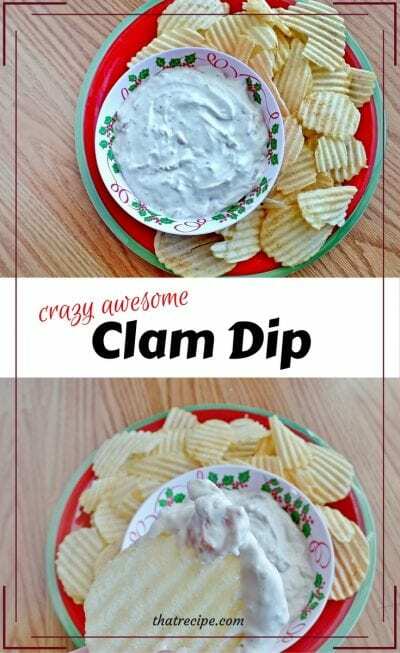 An easy Clam Dip Recipe with plenty of garlic and Worcestershire sauce. Great for parties. Serve with chips or vegetables or fill a bread bowl. Drain 2 cans of clams. Drain the final can BUT reserve the juice from this can for thinning the dip. In a medium mixing bowl, combine cream cheese, 2 or 3 cloves chopped garlic and a few tablespoons of sour cream. Thin to desired consistency with clam juice and a little extra sour cream. Make the dip thin enough the chip won't break but not soupy. Add a few splashes of Worcestershire sauce and some freshly ground black pepper. Fold in the chopped clams gently so they do not completely fall apart. Refrigerate at least 1 hour before serving. Add more chopped garlic, Worcestershire and pepper as needed. 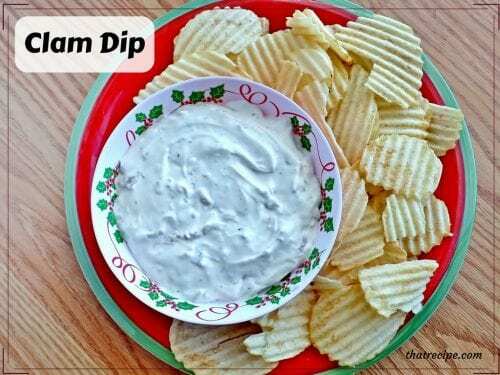 I think I could survive on dip alone! Happy Tuesday! Oh Lisa, it was so delicious! Audrey, my Caramelized Onion Dip is #127, and I had to come check out your clam dip because I’m really into dip this week! You cracked me up, so I have to admit that *I* “may or may not have” eaten a huge amount of this dip by myself! 😀 So don’t get me started on a batch of clam dip!